Pregnancy outcomes can be improved by following important nutritional guidelines; achieve a healthy body weight prior to conception and maintain appropriate weight gain during pregnancy, take a folic acid supplement and consider a low dose iron supplement, use iodised salt and if taking a multivitamin supplement, ensure that excess vitamin A is not consumed. If consuming a multivitamin and mineral supplement during pregnancy, choose a supplement containing folic acid, iron, and potassium iodide and be careful not to take excess vitamin A. IN BPJ 15 (AUGUST 2008), we covered the topic of vitamin and mineral deficiencies. GPs tell us that they would like more information on what supplements or additional foods they should be prescribing or recommending for women who wish to become pregnant or those who are pregnant. The importance of ensuring good maternal health during pregnancy is widely recognised while an increasing body of evidence suggests that nutritional status prior to pregnancy strongly influences foetal and infant outcomes. In view of this, the goal is to ensure that women attain good nutritional status before, during and between pregnancies to optimise their own health and reduce the risk of pregnancy complications, birth defects and the onset of chronic diseases in their children. Improving nutritional status before pregnancy is challenging because about half of pregnancies in New Zealand are not planned.1,2 Even among women planning pregnancy, few seek medical or nutritional advice prior to conception, and most women do not have their first prenatal care visit until well into the first trimester. It is well established that folate decreases the risk for neural tube defects. Women planning a pregnancy, or who are in the early stages of pregnancy, are advised to take a daily folic acid supplement of 800 mcg for at least four weeks before, and up to 12 weeks after conception (although women are recommended to continue with this supplement throughout pregnancy). Higher doses (5 mg daily) are recommended for those who have had a previous neural tube defect affected pregnancy, a family history of neural tube defects, or are taking anticonvulsant drugs. Supplementing with 400 mcg of folic acid is sufficient to reduce the risk for women who have no history of neural tube defects, however only 800 mcg or 5 mg tablets are currently available as registered medicines in New Zealand. Mandatory folic acid fortification of bread next year will ensure that all women who become pregnant � planned or unplanned � will receive some preconceptional folic acid. A substantial amount of iron is required during pregnancy to meet foetal and maternal needs. About 40% of women aged 15�44 years in New Zealand have an inadequate intake of iron. Adequate pre-pregnancy iron stores may play a role in reducing risk for iron deficiency and anaemia during pregnancy. Sub-optimal iron stores are difficult to replenish once pregnant. Many questions remain unanswered regarding how the mother�s nutritional status influences pregnancy outcome. Consequences of deficient or excessive nutrient intakes are difficult to determine, and assessment of vitamin and mineral status during pregnancy is not easy due to a lack of pregnancy-specific laboratory values. Based on available evidence, a healthy and varied diet can provide adequate energy and meet the mother�s requirements for most nutrients. Selected vitamin and minerals that are likely to be limited in the diets of pregnant women are briefly highlighted. 400 mcg folic acid or 600 mcg dietary folate? The 400 mcg recommendation to reduce neural tube defects is based on folic acid (synthetic form of folate) only. The 600 mcg recommended during pregnancy is in the units of Dietary Folate Equivalents (DFE) (food folate = 1 mcg DFE and folic acid = 1.7 mcg DFE). So essentially the 400 mcg folic acid tablet recommended preconceptional is worth 680 mcg DFEs and pregnant women then meet both recommendations by taking a supplement. Post-closure of the neural tube (after the first trimester) it is recommended that women intake 600 mcg DFEs. It is possible to obtain this all from the diet but this would involve large amounts of foods such as broccoli and spinach. Therefore women are recommended to continue with a folic acid supplement in addition to a folate rich diet for the entire pregnancy. This recommendation stands regardless of fortification of the food supply. Additional iron requirements during pregnancy increase substantially from the first trimester to the third trimester. A recommended dietary intake of 27 mg per day for the entire duration of pregnancy builds iron stores in early pregnancy for the third trimester. Although women should be encouraged to consume plenty of iron rich foods during pregnancy, obtaining the recommended intake from diet alone is difficult. Survey data of pregnant women in New Zealand indicate mean iron intakes between 11�14 mg per day.4 The highest prevalence of low iron stores, iron deficiency and iron-deficiency anaemia is among New Zealand Māori women, particularly aged 15�24 years.4 Maternal anaemia is associated with infant mortality and premature delivery. For those who consume no or small amounts of animal source food, or when low iron stores are suspected, a low-dose iron supplement (30 mg ferrous iron per day) taken at bedtime or between meals is advised. When iron deficiency with or without anaemia is diagnosed, larger doses of iron supplements (~100 mg ferrous iron per day) may be advised to improve iron status as early in pregnancy as possible.6 Although there is currently insufficient evidence to recommend for (or against) routine iron supplementation of all pregnant women, the U.S. Institute of Medicine, recognises that many women have suboptimal iron stores and advise daily low-dose iron supplementation (30 mg) to all women in the second and third trimesters. Requirements for iodine increase in pregnancy due to a marked change in thyroid function. Despite the upcoming mandatory fortification of bread with iodine in 2009, pregnant women will likely have intakes below the recommended level of 220 mcg per day. Median iodine intakes of New Zealand pregnant women are estimated between 60 to 70 mcg per day.11 Iodine deficiency during pregnancy can negatively affect both maternal and infant thyroid function and cognitive development of the infant. 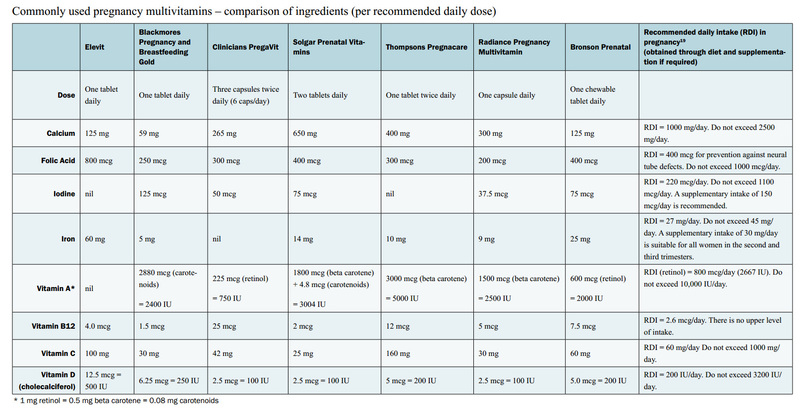 Despite lack of clinical data on the effect of iodine supplementation on birth outcomes in mild to moderately deficient pregnant women,12 several health authorities recommend that pregnant women consume 150 mcg per day of potassium iodide to prevent deficiency.13, 14 Currently there are no single oral iodine preparations available as registered medicines in New Zealand. Seaweed and kelp tablets should not be used as the iodine content in these products is extremely variable and can be toxic. Iodine supplements are now funded. For more information, see "Snippets: Iodine supplements Zoledronic acid & Atorvastatin", BPJ 30 (August, 2010). During pregnancy, the lack of vitamin D may adversely affect foetal bone and accumulation of newborn vitamin D stores.15 Vitamin D increases intestinal absorption of calcium. Rickets is a clinical marker of poor pre- and postnatal bone health caused by vitamin D deficiency. There have been reports that rickets is re-emerging though its prevalence in New Zealand is unknown. Many experts agree that the recommended adequate intake for vitamin D of 200 IU per day during pregnancy is grossly underestimated.18 Studies are currently underway to address the effect of vitamin D supplementation during pregnancy on the nutritional vitamin D status in both mother and foetus. For all other vitamin and minerals in pregnancy, there is little evidence to support routine supplementation unless inadequate nutrient intakes are suspected. Women who are taking multivitamin/multimineral supplements should be cautioned to avoid exceeding intake of 10,000 IU (3,330 RE) of vitamin A (retinol) per day. Schader I, Corwin P. How many pregnant women in Christchurch are using folic acid supplements in early pregnancy? NZ Med J 1999;112:463-5. Dobson I, Devenish C, Skeaff CM, Green TJ. Periconceptional folic acid use among women giving birth at Queen Mary Maternity Hospital in Dunedin. Aust NZ J Obstetrics and Gynaecology 2006;46:534-7. Hauger MS, Gibbons L, Vik T, Beliz�n JM. Prepregnancy weight status and the risk of adverse pregnancy outcome. Acta Obstet Gynecol Scand. 2008;87(9):953-9. Ministry of Health. 2008. A Portrait of Health: Key results of the 2006/07 New Zealand Health Survey. Wellington: Ministry of Health. Olsen CM. Achieving a healthy weight gain during pregnancy. Ann Rev Nutr. 2008;28:411-23. Institute of Medicine, Food and Nutrition Board, Committee on Nutritional Status During Pregnancy and Lactation, Subcommittee on Dietary Intake and Nutrient Supplements During Pregnancy, Subcommittee on Nutritional Status and Weight Gain During Pregnancy. Nutrition during pregnancy. Part I - Weight gain. Part II - Nutrient supplements. Washington, DC: National Academy Press; 1990. Linne Y, Dye L, Barkeling B, Rossner S. Long-term weight development in women: A 15-year follow-up of the effects of pregnancy. Obes Res. 2004:12:1166-78. Stotland NE, Haas JS, Brawarsky P, Jackson RA, Fuentes-Afflick E, Escobar GJ. Body mass index, provider advice, and target gestational weight gain. Obstet Gynecol. 2005;105(3):633-8. Cogswell ME, Scanlon KS, Fein SB, Schieve LA. Medically advised, mother's personal target, and actual weight gain during pregnancy. Obstet Gynecol. 1999;94:616-22. Beard JL, Hendricks MK, Perez EM et al. Maternal iron deficiency anemia affects postpartum emotions and cognition. J Nutr 2005;135:267-72. Thomson CD, Packer MA, Butler JA, et al. Urinary selenium and iodine during pregnancy and lactation. J Trace Elem Med Biol 2001;14:210-7. Zimmerman MB. The adverse effects of mild-to-moderate iodine deficiency during pregnancy and childhood:a review. Thyroid. 2007;17:829-35. Sullivan K. Iodine supplementation for pregnancy and lactation: United States and Canada: recommendations of the American Thyroid Association. Thyroid 2007;483-4. Morley R, Carlin JB, Pasco JA, Wark JD. Maternal 25-hydroxyvitamin D and parathyroid hormone concentrations and offspring birth size. J Clin Endocrinol Metab. 2006;91(3):906-12. Rockell JE, Skeaff CM, Williams SM, Green TJ. Serum 25-hydroxyvitamin D concentrations of New Zealanders aged 15 years and older. Osteoporos Int. 2006;17:1382-9.